For the past 2 decades, we have been running the Farmers’ Market Nutrition Program (FMNP) here in Central Texas. Partnering with the Texas Department of Agriculture and Texas WIC, this seasonal program (April through October), provides families who participate in WIC (Women Infant and Children) more incentives to shop locally to purchase fresh and seasonal fruits and vegetables from our Texas farmers. The Farmers’ Market Nutrition Program is not a statewide program, so we are very fortunate to have it available here in Austin. Each year, this program brings thousands of new customers out to the farmers’ markets and provides local farmers with tens of thousands of dollars in additional revenue! Last year, FMNP resulted in approximately $56,000 in sales from the vouchers and another $37,000 from the matching incentives. This program benefits low-income families, local farmers, and puts more dollars into the local economy. It’s a win all-around! This program is available at both SFC Farmers’ Market Downtown and Sunset Valley. We have also partnered with Texas Farmers’ Market to offer the program at their Lakeline and Mueller markets as well. 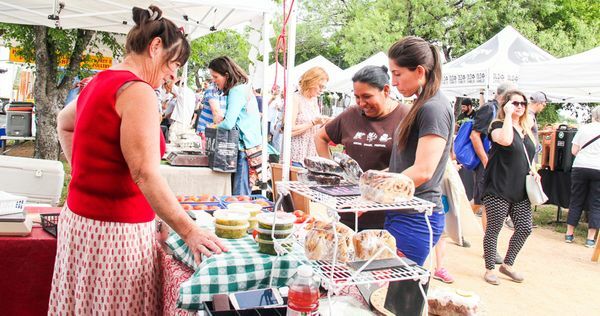 At any of these markets, each eligible participant can receive $30 in vouchers and an additional $30 double dollars; a total of $60 for the purchase of Texas grown, fresh fruits and vegetables. When combined with additional educational opportunities, like preparation, storage, and nutrition, the program can have even greater impacts! So this year we will be offering recipe samplings throughout the season at SFC Farmers’ Markets. While FMNP is a great way to introduce someone new to the market, we want to provide individuals with the resources, knowledge, and agency to continue accessing fresh fruits and vegetable for their families and themselves all year long!